(VEN) - The Ministry of Finance recently held a press conference to announce the results of the strategy to develop the insurance market in the 2011-2015 period and propose implementation measures for the 2016-2020 period. Phung Ngoc Khanh, Director of the Insurance Supervisory and Authority, said the insurance market had been the midwife of the economy. Total value of insured assets from 2011 until the end of 2015 was VND11,700 trillion, with the value of insured business assets accounting for more than VND10,000 trillion, the insured value in the field of life insurance accounting for VND1,000 trillion, and VND700 trillion in the field of medical and health insurance. Statistics show that by the end of 2015, total sales of insurance premiums in the Vietnamese insurance market reached an estimated VND84.37 trillion, equal to about two percent of Vietnam’s gross domestic product (GDP); insurance companies’ provisions for compensation payments totaled an estimated VND130.39 trillion, 2.36 times higher compared with 2010. Insurance Supervisory and Authority Deputy Director Doan Thanh Tuan said the insurance market contributed over VND4.97 trillion to the state budget through the payment of corporate income taxes in the 2011-2015 period. Specifically, life insurance companies paid more than VND2.57 trillion; and non-life insurers paid over VND2.4 trillion. Insurance companies have contributed to balancing the state budget. In the opinion of economists, the insurance market has played well the role of the ‘midwife’ for the economy. So far, about 80 percent of construction works have been insured. By the end of 2015, reinvestment in the economy by insurance companies reached more than VND157.26 trillion, up 1.99 times compared with 2010. Insurance companies currently own 50 percent of all government bonds that have been issued, including 100 percent of 20-30 year and longer-term government bonds. This year marks an important transition to the next medium-term period, 2016-2010, in the implementation of the strategy for insurance market development. To successfully implement the strategy in this period, according to the Ministry of Finance, it is necessary to check and improve the legal framework for insurance businesses; propose policies that encourage insurance companies to develop products that are important to socioeconomic development and implement social security policies related to public asset management, natural disaster insurance, and compulsory insurance for motorized vehicle owners and construction investors. State management agencies will create favorable conditions for insurance companies to develop through persifying their products and distribution channels. They will tighten management and deal strictly with illegal acts to ensure the safety, efficiency and competitiveness of insurance companies. Market development measures will continue to be implemented in order to improve the business environment in the direction of ensuring transparency. 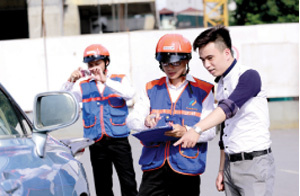 Sixty one companies currently operate in the Vietnamese insurance market. These include 29 domestic non-life insurers, one branch of a foreign non-life insurance company, 17 life insurers, two reinsurance companies, and 12 insurance brokers.